"3MI6, Upper Burial No. 1, Vessel 1346; 5425.2200" by Timothy K. Perttula and Robert Z. Selden Jr.
DECORATION (INCLUDING MOTIF AND ELEMENTS WHEN APPARENT): The rim has two rows of tool punctations, one under the lip and rim peaks, and the other at the rim-body junction. Intervening areas on the rim has sets of four curvilinear and four horizontal incised lines. The body decoration is demarcated at the top of the body with four horizontal incised lines and two curvilinear lines, with the area between them filled with short vertical incised lines. The remainder of the body design consist of four sets of two stacked elements. The first stacked elements consists of three tiers of incised concentric circles (5-7 circles); the central and innermost circle has a radius of tool punctations and diagonal incised lines. The second element, which lie between the concentric circles, includes a stacked series of incised rectangles, with internal rectangles and opposed L-shaped lines. These incised rectangles are within a larger rectangle delimited by incised lines and superimposed tool punctated rows. On the bottom tier, both the concentric circles and incised rectangles are partially enclosed in a zone of tool punctations near the vessel base. 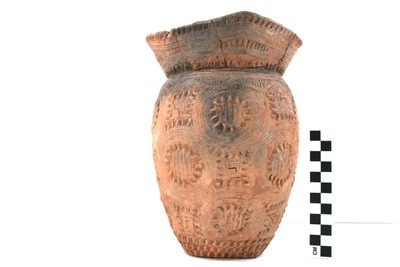 Haley Complicated Incised jar, Vessel 1346.